But there finally in front of me was Red the Border Collie. The morning of the Open House at Bedlam Farm arrived with crisp, sunny weather as well as a layer of frost on my car’s windows. With no dogs to feed, potty and fuss over I was able to get an early start to my drive from Latham to Cambridge. I turned the Ford Fiesta to the now familiar route, passing green dew-soaked fields, herds of deer and a possible sighting of coyotes off in the distance. I slowed down, remembering how the deer along the Willamette River in Oregon would pace my car, sometimes darting in front of it, usually a grim decision for both the deer and drivers. Turning into the now familiar town I parked and walked into the Round House Bakery and Cafe. I entered a world of laughter, comfort and belonging. Maria and Jon treated me like family, like a long lost friend that you can see once a day or once in a decade and still feel a warm connection. But there finally in front of me was Red the Border Collie. After all the stories about this legendary dog, in this room he was not unlike my dogs, working the crowd, looking for offerings of food, stopping here and there to receive a nuzzle, a pat, a soft word. I felt a connection with Red as I do with my own Border Collies. Would my dogs have acted as calm and cool as Red in a room full of people? The answer is a resounding no. My supposedly obedience-trained dog’s love for people overwhelms them sometimes, they squeal, they nudge hands, then one furry foot and another steps up into people’s laps. Not Red, a true working dog, well-mannered. A word from Jon and Red wagged his tail and left with his shadow, back to his job at the farm. I walked around town one more time, both in an attempt to get some exercise and to visit more stores. The residents of Cambridge continued to show warmth to all visitors. My next stop was to the grocery store to buy carrots for a celebrity donkey named Simon. The goal of the trip was, after all, to kiss Simon’s nose, feed him carrots and take his picture. Twenty minutes later I turned my car into a nearby field and walked over to the red barn to see Simon. His nose was a moving target as he nudged his soft muzzle through the gaps in the wooden gate, imploring the dozen admirers to hand over their offerings. I fed Simon, as well as his female companions, Lulu and Fanny, their soft lips tickling my fingers, no nipping or grabbing. 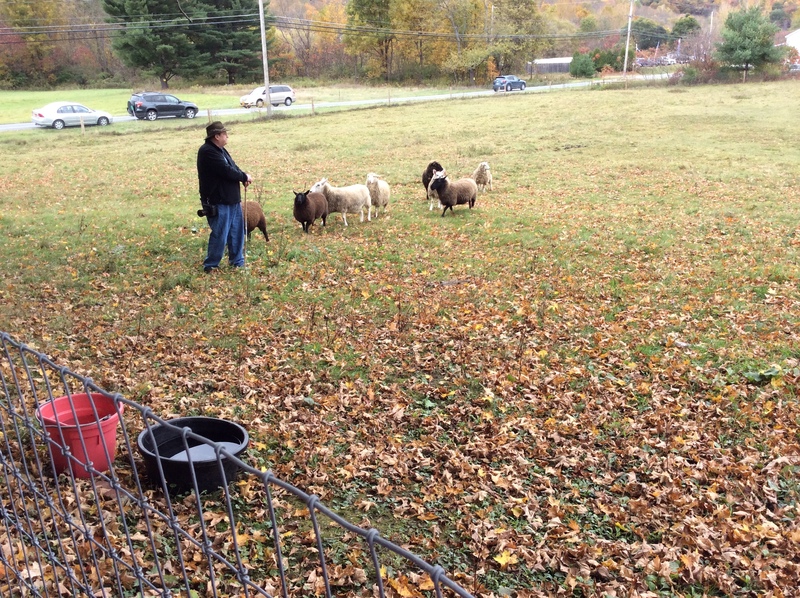 The day progressed to cuddling with a barn cat named Flo, meeting online friends, and watching Red, who herded the sheep with an intensity of purpose that would make a Type-A person feel inadequate. He was a different dog than the one in the Café. Here he was part of a working team with Jon. I walked into Maria Wulf’s craft building that was set up with displays of her self-designed and free-arm sewn potholders and quilted handkerchiefs, as well as other artist’s needlework, books and felted items. As the noonday sun warmed all of us I felt a desire to move on. It wasn’t that I wasn’t excited to be there but my inherent restlessness to explore kept me moving. At one time Jon Katz had purchased a ninety-two acre farm in the town of Hebron, New York. It was a mere sixteen miles north of his current farm. To understand Jon’s life journey I suggest reading his book, Running To The Mountain , as well as his subsequent books. After viewing numerous outstanding photographs of the original Bedlam Farm that Jon has taken over the years, I couldn’t imagine why he would want to sell it. Jon had mentioned that the farm was now unoccupied. I would not be intruding on anyone if I drove by the farmhouse so I turned my Fiesta toward Hebron. Although a short drive the farm is nestled deep in the countryside. I imagined a life there in winter would be one of isolation. When my eyes first viewed the farm I saw a huge responsibility, numerous buildings, steep fields that rose up and up and up seemingly to the sky. It will take a special person to give the farmhouse, barns and fields a new life; perhaps another writer, a sheep or horse breeder? Turning my car around, my new goal was to stop at a place I had passed called Gardenworks Farm. Their sign read, “Cider Donuts”. What are cider donuts, I wondered? My diet went out the door as I went inside the barn that was filled with handmade items, food, wine, pumpkins and donuts. I left with six cider donuts. If I was staying in town for a week I’d have also purchased soup, wine and cheese from the farm, hearty homemade food. The good thing about Google Maps is you can never get lost, assuming you have cell service, which apparently is spotty north of Cambridge. I didn’t panic, going by landmarks where possible, turning around when I made wrong turns. Once in Cambridge though, still unable to connect to Verizon, I made more wrong turns. Oddly I still didn’t panic. The compact car had a half tank of gas; the sun would not set for several hours. This trip was meant to be an adventure. In my life I’ve been lost many times but always landed on my feet eventually. Gradually landmarks became familiar, the 129.9 acre farm that was for sale; further down the road were two beautiful horses standing by the gate facing the farmhouse, waiting. Within the hour I found the town of Schaghticoke, Route 40 and Latham. Sitting in my hotel room that evening I mentally reviewed all the talented people I’d met, whose names became lost and intertwined in my mind: musicians, writers, photographers, a cross stitch artist, poets. I felt humbled. How did I wind up in the middle of this crowd, a field mouse in a land of giants? The answer lies in a book, A Good Dog: The Story of Orson, Who Changed My Life, a less than perfect Border Collie that Jon tried to assimilate into a world of sheep, people and conformity. The legion of people who judged Jon for his decisions about his life and his dogs has always upset me. For some reason, as I read each of Jon’s books I became more involved with his story about his life and his dogs. At some point when Jon put a blog on Facebook, he and his dogs became real, not words and pictures in a book. Jon had transformed his story into a living, breathing day by day chapter with increasingly breathtaking photographs. Years after I read A Good Dog I had an unfortunate personal opportunity to relate to Jon’s plight with Orson. I had a beautiful Border Collie named Mickey who had bad hips, who attacked my other dogs relentlessly and even went after a friend’s dog at a dog show. When he almost ripped out my beloved Levi’s eye I knew he was becoming dangerous. The vet didn’t want to euthanize Mickey. He patted the dog on his back during an evaluation and Mickey turned and growled. The vet understood my plight. Mickey was euthanized. Some dogs cannot be rehabilitated, their scars, their pain so deep that options become minimal. I was judged for my decision with Mickey, as was Jon with Orson. Sometimes there are no happy endings in life. 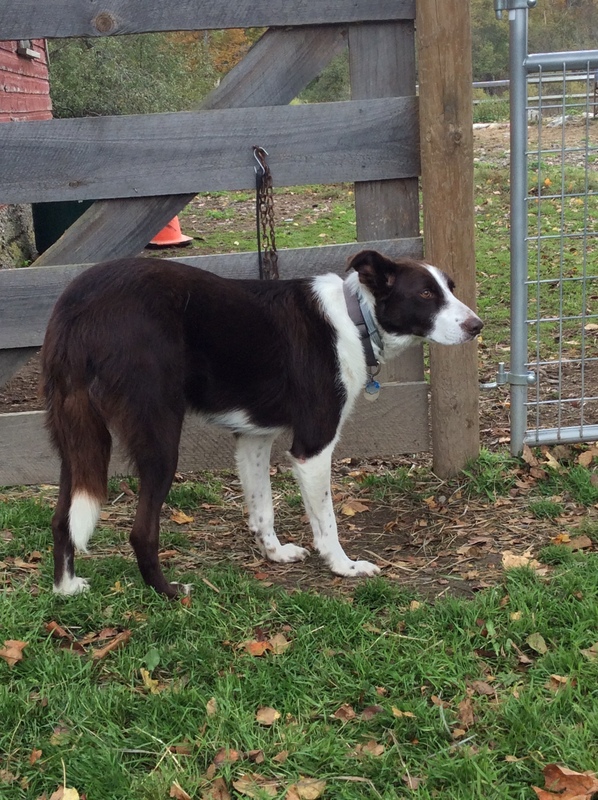 This entry was posted in border collies, dog obedience, Dog training, Dogs, Jon Katz, Retirement Life and tagged Bedlam Farm, Border Collies, dog obedience, Dog training, Jon Katz, Maria Wulf, retired life. Bookmark the permalink. Again, you’ve drawn me right in! Phil and I left a bit early on some days to go exploring as well. I often joke that we were both born with gypsy shoes on our feet. I am beginning to be captivated by the idea of hand stitching…gorgeous textures and it seems a lovely way to slow things down. As soon as I got home I grabbed a Jo-Anne’s coupon and bought some books on felt embroidery. Who knows where that will lead. I was impressed by the felt items in Maria’s craft barn. I agree about the gypsy shoes. Next year maybe I’ll slip off and go as far as Maine.